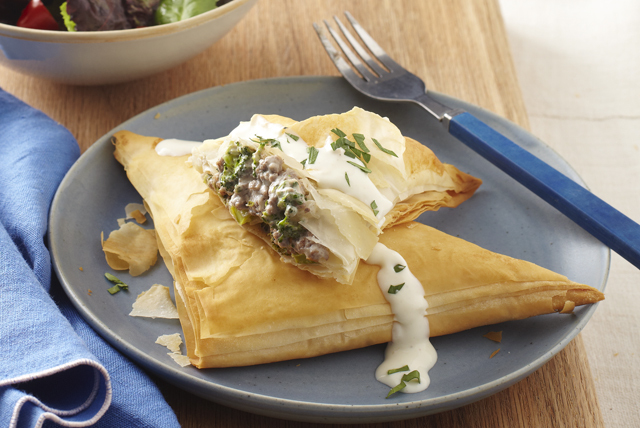 Turn ground beef and broccoli into something special with a creamy garlic sauce and crisp baked phyllo crust. Mix cream cheese spread, 2 Tbsp. milk and garlic until blended. Reserve 3 Tbsp. cream cheese mixture. Brown meat with onions in large skillet. Add broccoli; cook and stir 3 min. Stir in flour and pepper. Add remaining cream cheese mixture and sour cream; cook and stir on low heat 2 min. or until heated through. Stack 3 phyllo sheets on work surface, lightly brushing tops of first 2 sheets with margarine. Cut phyllo stack lengthwise in half with pizza cutter. Repeat with remaining phyllo sheets to make a total of 16 strips. Spoon 3 Tbsp. meat filling onto 1 end of 1 phyllo strip, about 1 inch from corner. Fold over opposite corner to form triangle. Continue folding, like a flag, to opposite end. Repeat with remaining phyllo strips. Place turnovers, seam sides down, on baking sheets; brush with remaining margarine. Bake 12 to 15 min. or until golden brown. Mix reserved cream cheese mixture and milk. Place turnovers on platter; drizzle with cream cheese mixture. Sprinkle with parsley. These flakey turnovers can be frozen before they are baked. Simply freeze in single layer on baking sheets. Then, transfer to freezer container, placing parchment between layers. When ready to bake, place desired number of turnovers in single layer on baking sheet, then bake in 400ºF oven 15 to 18 min. or until golden brown and heated through. Prepare using regular Philadelphia Brick Cream Cheese, 2% milk, regular sour cream and butter.